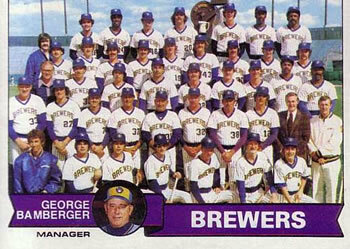 The Milwaukee Brewers played in the American League East division from 1972-93. In 2017, the Brewers will play many of their old foes from the East in Interleague matchups. Baltimore, Boston, Toronto, and the New York Yankees are all on the schedule this season. To celebrate the glory days of the old AL East, I’ve created a “classic opponents” series of blog posts. I’ll be covering great games, opposing teams, and even individual players from the East, particularly from Milwaukee’s golden baseball era of 1978-82. Both New York and Milwaukee had high hopes for the 1979 season. The Yankees were coming off the AL East tie-breaker finish with Boston, which they won on their way to an eventual World Series title over the Los Angeles Dodgers. The Brewers had turned their franchise around the previous season, winning 93 games. With five teams in the AL East expected to finish above .500 in 1979 and so may head-to-head games, it was entirely possible that either Milwaukee or New York could capture the pennant. The Yankees and Brewers opened the season with a series in New York on Thursday, April 5. 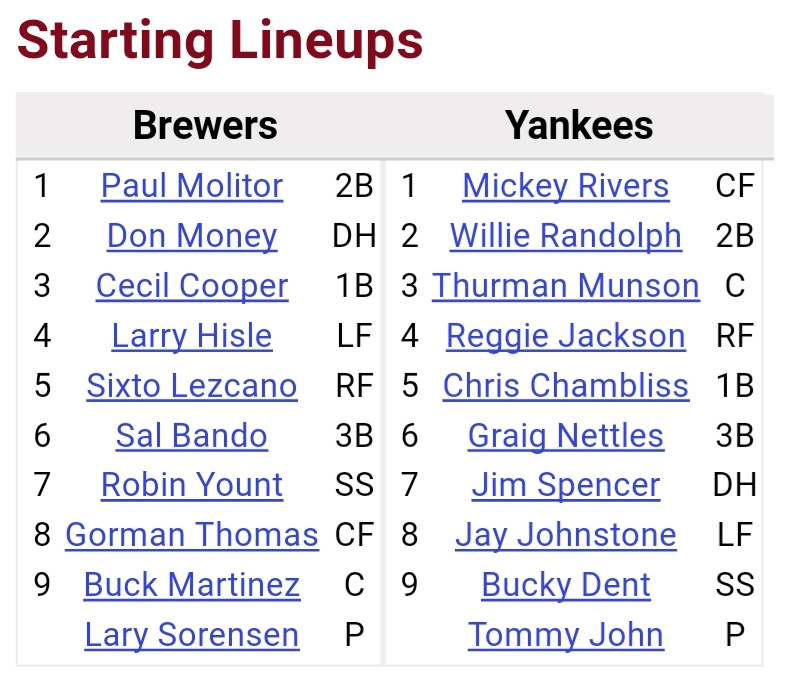 The Brewers broke open a great duel between Mike Caldwell and Ron Guidry on Opening Day with four runs in the sixth inning. Milwaukee went on to win 5-1. On Saturday, Milwaukee held off a late rally and hung on for a 4-3 victory. Could they win on Sunday and sweep the series? Talk about two teams with stacked lineups. You just couldn’t argue with a Brewers team with Paul Molitor, Robin Yount, Cecil Cooper, Larry Hisle, Gorman Thomas, and Sixto Lezcano…just to name a few! 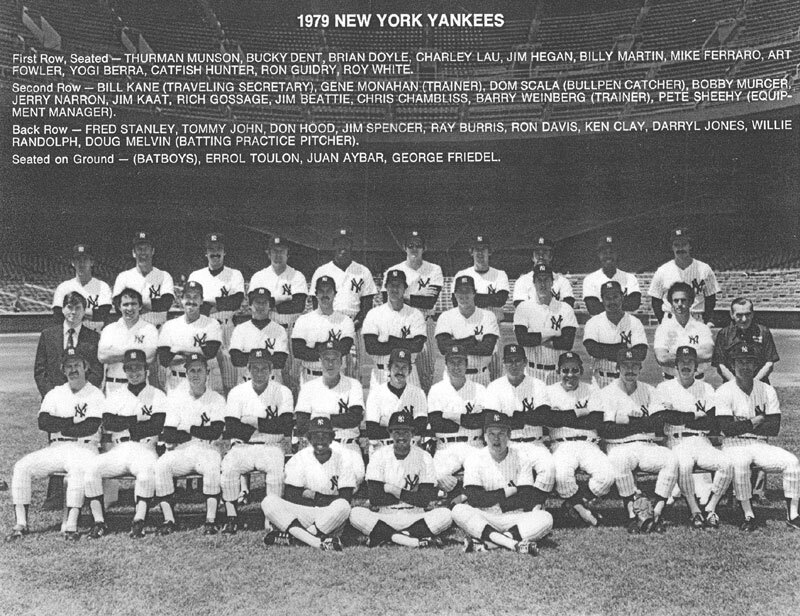 New York was loaded with big hitters including Graig Nettles, Reggie Jackson, Chris Chambliss, Thurman Munson, Mickey Rivers, and Willie Randolph. 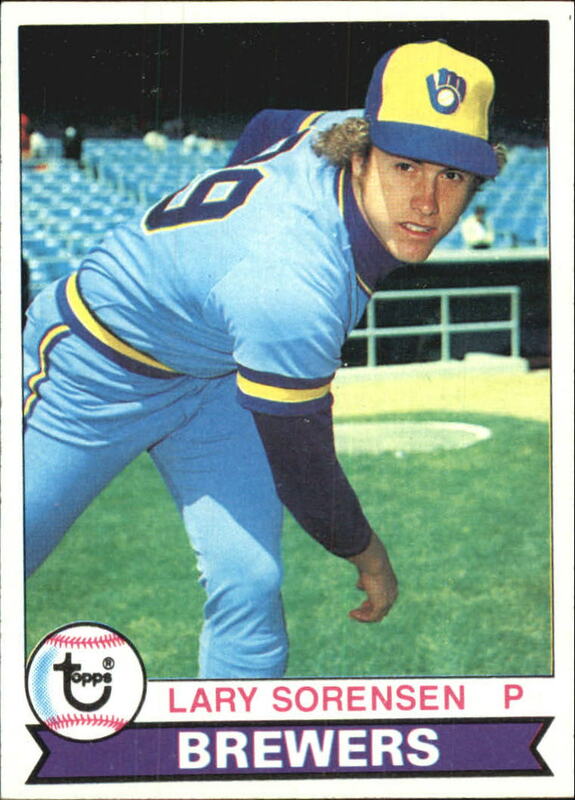 But if you’re going to have a chance to shut down all those bats, send Lary Sorensen to the mound against Tommy John. Sorenson was coming off an 18-win season – his first full year in the bigs. 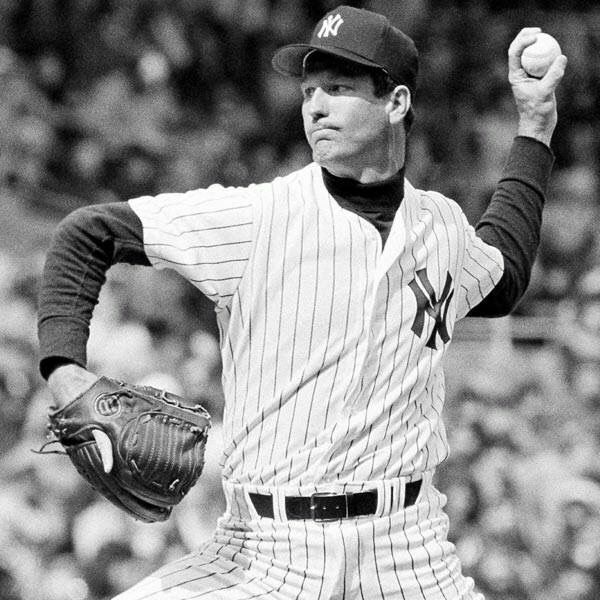 John was making his first start for the Yankees after signing a free agent contract, and would turn 36 the following month. He had actually considered going to the Brewers during the offseason. For a while it looked like John might wind up in Milwaukee, but the Brewers instead signed Jim Slaton to round out their pitching staff. Milwaukee scored right away in the top of the first inning on Sunday. Paul Molitor led off the game with a single. After a fielder’s choice moved Molitor to second, Cecil Cooper singled to right field to bring him home. In the bottom half of the first, Sorensen retired Mickey Rivers, Willie Randolph, and Thurman Munson in order. New York put two runs on the board in the bottom of the second inning in front of 26,954 fans. 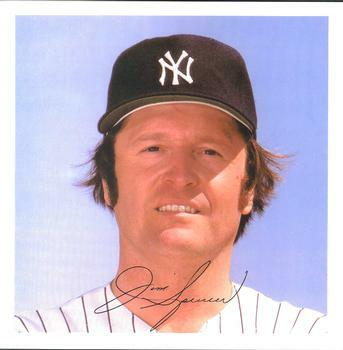 After Sorenson got Reggie Jackson to ground out, Chris Chambliss singled. Graig Nettles was up next and he lined out to Paul Molitor at second. With two outs, designated hitter Jim Spencer hit a homer to give the Yankees a 2-1 lead. Both teams had opportunities to score in the middle innings, but neither could get across the plate. Gorman Thomas hit a long drive to the left-field fence to lead off the third inning and wound up with a double. Sorensen said it would have been a homer “in any other park.” John retired the next three hitters to end the inning. Larry Hisle had a double in the fourth inning and moved to third on a groundout, but again John escaped without damage. On the other side, New York had runners on in the fourth and fifth, but both times Sorensen got a double play to halt the threats. In the bottom of the sixth the Yankees again put runners in scoring position. Willie Randolph walked and Reggie Jackson doubled to put runners at second and third. Chris Chambliss grounded out for the final out of the inning. The best opportunity Milwaukee had to score again off John came in the top of the seventh. Sal Bando singled to center and was forced out at second on a groundout to short. Gorman Thomas walked to put runners at first and second, but pinch hitter Ray Fosse grounded out to end the inning and the night for Tommy John. Goose Gossage came on in the eighth inning to try to nail down the victory for John. He did give up two hard up balls along the way. The first was a single to Cecil Cooper in the eighth, but that was the only hit. He retired the side in order in the ninth, but not before Sal Bando flew out with a long opposite field drive to the middle of the warning track in right field. New York won 2-1 despite being out hit 7-6 by Milwaukee. It was a brisk game that clocked in at an hour and 50 minutes. Sorensen didn’t strike anyone out and John fanned just one hitter, but both benefitted from a lot of ground ball outs. John hadn’t seen six of the ten Brewers that batted against him. The ones he had pitched against were opponents back in the early 1970’s. Even though Sorensen and the Crew took a tough loss, they did take the series and set the tone for a good April. Neither team made the playoffs in 1979. Milwaukee did win the season series with New York 9-4. The Brewers pulled off two dramatic walk-off wins over New York. To even things out, the Yankees beat Milwaukee in two extra-inning games in late May. The Brew Crew improved a bit overall and finished with a 95-69 record, but it wasn’t enough as Baltimore cruised to a 102-57 mark. New York slipped quite a bit in the standings from where they finished in 1978. The Yankees came in a distant fourth at 89-71 after the tragic death of catcher Thurman Munson in August.